The first weekend in October was a benchmark, of sorts, for many Club Ed racers. 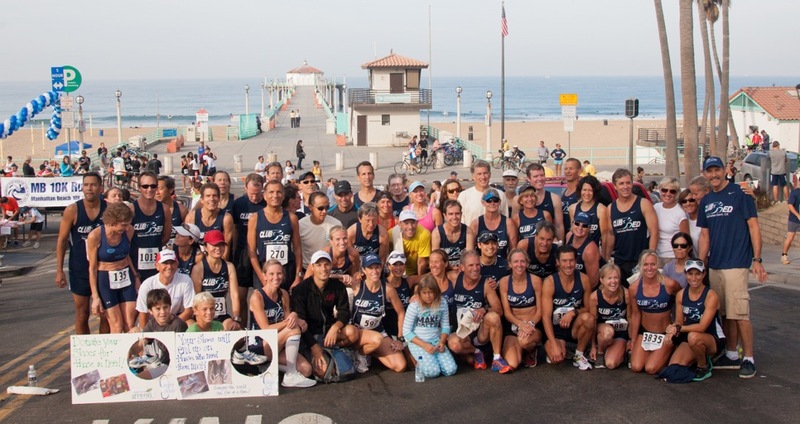 The annual running of the Manhattan Beach Hometown 10K, to some, represents the culmination of a year of training and a chance to make amends for previous years’ results. In 2012, the first October weekend also marked the running of: the Chicago Marathon, and Club Ed was there; the Long Beach Marathon, and Club Ed was there; the Santa Monica 5K/USATF Grand Prix Road Race, and Club Ed was there; the Hermosa Beach Triathlon, and Club Ed was there, too (…and we won’t even get into our presence at the Hometown Fair Beer Garden!). Leading the way was Chris Tregellis (34:23, 7th OA) and Nathalie Higley (36:08, 13th OA). For Chris, the race was a vindication of a well-spent summer of runs that bode well for his upcoming track season. For Nathalie, it was her 11th win at Hometown, with a finish time (and racing panache) that continue to impress us all. In age-graded adjusted performance, Nathalie actually WON the race, posting an impressive 87.96%...and Nathalie and Chris were also the first Masters finishers, female and male respectively, in the race. Hard-working (and Birthday Boy) Mark Shalvarjian celebrated his 50th by chasing son Tyler around the course. Though he missed catching Tyler by a few yards (37:39 vs. 37:31), the spritely pair dominated (by 10 minutes!) the Father-Son Division race. Many other inspiring stories to tell for those who ran, so don’t be bashful – speak up…and Congratulations! Meanwhile, in Chicago, Sabina Helton (4:08), Trish Riley (4:08), Jason Zellen (4:09), Bill Weber (3:04), and Steve Weber (4:17) took to the streets on a brisk Chicago morning (race-time temps in the high 30s to mid 40s). All finished the race, demonstrating their determination to succeed. Club Ed training partner Rick Weis started off in a flash (74 minutes at the half), but succumbed to the cold and dropped out of the race a few miles later. To all who went, started, and achieved, we are impressed by your spirit; we will try to keep up with you in the coming months! Several Club Ed runners were there, braving unexpectedly warm (high 70s) and humid conditions. Among them, Sam Dillman got off to a good start (1:30 at the half) but struggled in to finish in 3:18. Bryan Johnston paced through in 3:15, also fading a bit in the second half. Manny Reed warmed up with the Pre-race Bike Tour through Long Beach, got back and jumped into the half-marathon, finishing in 1:51. Mike Sevier made his return to racing with a noticeably impressive 1:17 half. Santa Monica 5K/USATF Grand Prix Race: On a very busy weekend, sandwiched between marathons, 10Ks, and triathlons, several club members still managed to make it to the USATF Grand Prix race. This time, it was (once again) back in Santa Monica, for the 5K. Jon Megeff led our group in 16:36, good for 2nd Master and first in his age group (AG). Jim Newman recorded a respectable 21:40 (7th AG), and Karina Bird ran 21:50 (8th AG). Too many great runs by all of you to list here; with apologies, see the respective race web-based results. Keep running, keep racing, and keep training – amaze your friends, and chase down (and pass) your competitors.